You can see it clearly even from a distance from the tramway station also! 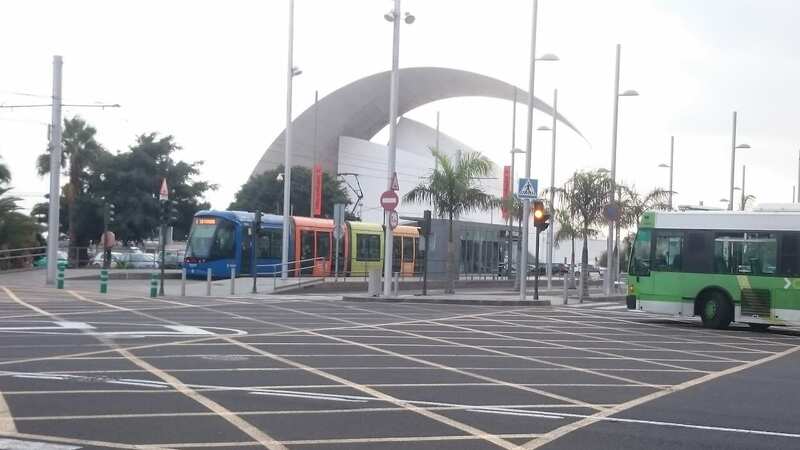 From the Intercambiador bus hub and tram station, you can reach Auditorio de Tenerife. You can take almost any busses here or T1 tramway line to it. The huge opera house is clearly visible from it and from many other areas in Santa Cruz as it is a hilly city. With its oval shapes, it is clearly a majestic type of building. Getting to the opera house though, is very not human friendly though. I wish there was a better way of getting to it from Intercambiador station. This station is a bus hub and here is where T1 tramway goes to and from. It would be nice if someone cleaned up the area in between. Getting to the opera house is not difficult, but a gigantic street and strange crosses creates irritation. If you go by car though, there is a huge parking space just beside it. But, what if you want to not polute? 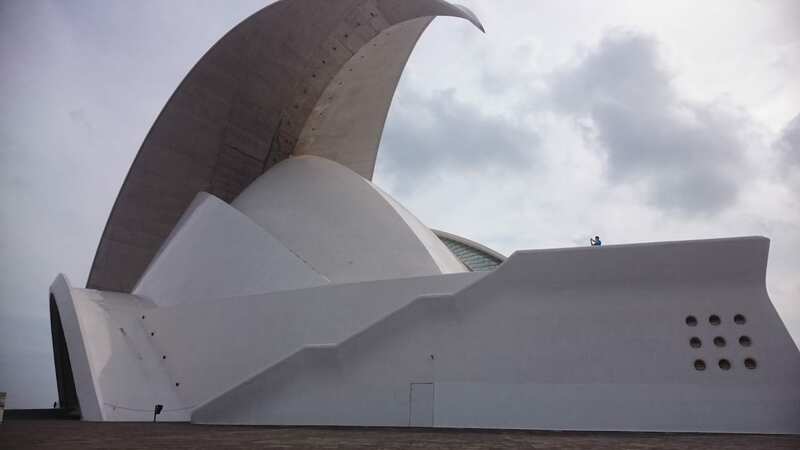 The company behind the tramway in Santa Cruz and La Laguna have exclusively told Distrita that there is a third line planned that will go along harbour and that this will ease peoples connection with the opera house. We hope that this will be an reality, because this opera house would have many more visitors if these issues were fixed. 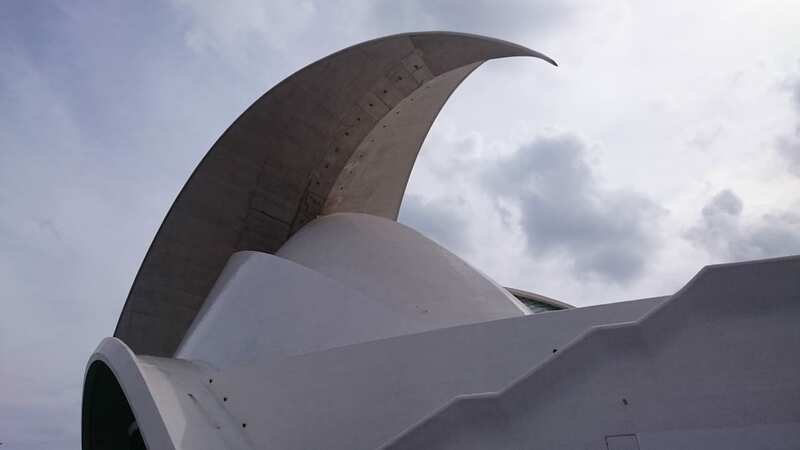 The majestic profile of the auditorium has become an architectural symbol of the city of Santa Cruz de Tenerife. It is highly majestic at where it is. Putting even the harbour to a shame. The design feels a bit 1970s high-tek design, but this seems to be the trend at the Canary Islands it seems. For my personal taste, its brilliant as it reminds me some of the futuristic designs in the James Bond 007 movies from 1970s. Perfect and Opera is about expression the old and the new, isn’t it? When looking over the edge beside the building towards the sea. 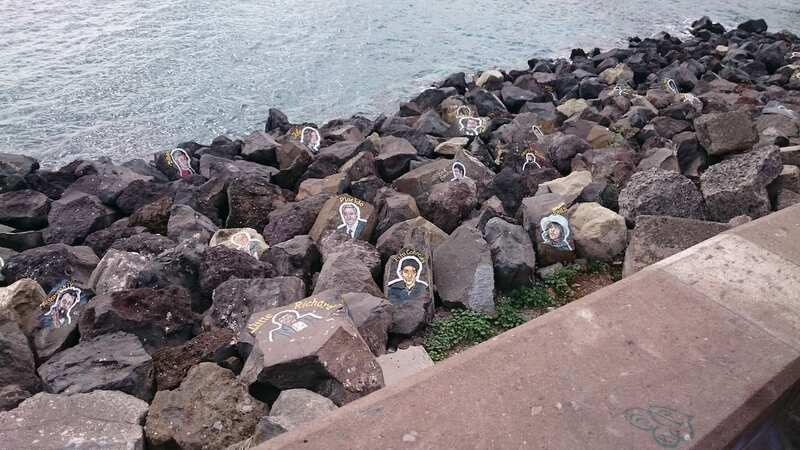 You can also notice these interesting faces on the stones if you look down. If you notice on one of them, you can see Placido etc. A very nice and for sure an artistic great idea. This gives for sure a really nice atmosphere to the area. The opera house building is normally lit in bright white at night, but more colorful lighting is used on special occasions. For example, on New Year 2007–2008 the auditorium was lit in white and yellow, and a clock was projected onto one wing of the building to mark the hours. In 2008, it was illuminated in green to celebrate 30 years of Transportes interurbanos de Tenerife, S.A. The gala event brings together various national and international Latin singers including Laura Pausini, Chayanne, Amaral, Amaia Montero, Eros Ramazzotti, Beatriz Luengo, Camila, Estopa, Luis Fonsi, Tiziano Ferro, Manolo Garcia, Melocos, Melendi, La Oreja de Van Gogh, Pitingo, Rosario and Sergio Dalma. Familiar faces in show business, television and radio have presented the awards: Paz Vega, Santi Millán, Fernando Tejero, Marta Torné, José Mari Manzanares, Elena Rivera, Jose Ramon de la Morena, Pablo Motos and Gemma Nierga. One of the unique events at this gala is the singer’s walk, a green carpet installed at the foot of the auditorium. The awards reach across the Atlantic via the radio network Union Radio Kiss Radio in Colombia, Mexico, Chile and Costa Rica, Continental Radio in Argentina and Top 40 stations of Panama, Argentina, Guatemala and Ecuador. In addition, the gala is broadcast on TV Canaria and Cuatro TV.